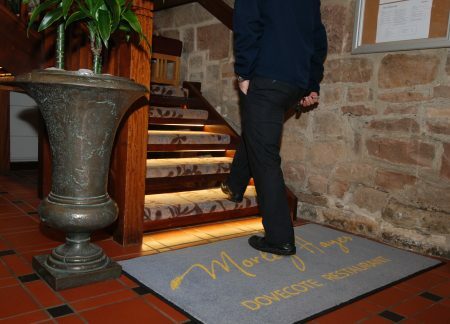 A great way to utilise the mat as an effective marketing tool creating a visual impact whilst still being functional. We will work with you to create your chosen design and are able to reflect your corporate colours in product. Giltbrook will ensure the size and colour are suitable for the mats location. We are able to reflect your corporate colours in the design of your logo Mat. Are made from an anti-bacterial nitrile rubber that is resistant to a variety of lubricants and liquids. Smooth drainage holes and the mats unique design means it will not harbor food particles or bacteria. The lightly textured surface provides traction when greasy and wet the product has built in handles to make moving and cleaning easier. Our ‘lift and lay’ service will ensure your mats are always clean and fit for use. We’ll collect your mats on agreed frequencies and leave behind laundered, clean replacements.